If Sony is launching itself into dematerialised music, then you know there’s going to be a big splash. 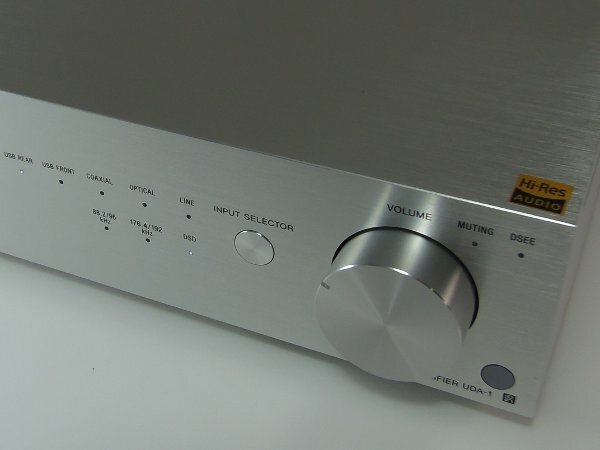 The head of a family which has several members already, the UDA-1 amp, which contains a DAC which can deal, via USB, with all currently-existing PCM audio files (except the very rare DXD) and also DSD (SACD format), which has become essential gear in Japan. There was a time when Sony was a champion of innovation in the Hi-Fi world. Have the worlds of mobile telephony and multimedia taken up most of the Japanese manufacturer?s resources, or is it that Sony has shown a certain reserve (or prudent patience) in engaging with the emerging dematerialised music market (which would be understandable for the inventor of the CD and the SACD)? However, at the last IFA Berlin Radio Show, Sony presented two Hi-Fi amps designed to read audio files: the UDA-1 model (the subject of this test bench) with USB DAC; and the HAP-S1, which has a disk reader, an integrated hard drive and also S/PDIF inputs, and which we will also test for you soon. A digital portable device which can read HD files (24 bits at 192kHz), the F886 was also presented by the inventor of the Walkman ? a move which sees the portable music device revisit its roots. In short, we can only be glad that a brand like Sony, which symbolises a sort of ?reference point? for many people, not necessarily just Hi-Fi enthusiasts, has decided to join the great adventure of dematerialised music. The pure lines of a Hi-Fi device, which have been likened to some silkscreen prints, often feel rather calming to look at. This is certainly the case with the Sony UDA-1, in its casing of natural anodised brushed aluminium, whose front panel and upper surface are one: it is a real source of pleasure for the eyes, which not even the markings of the crude vices used in tests at Qobuz can ruin? You got that right: this amplifier with USB DAC UDA-1 looks damn good. There is no surfeit of controls here: an activation button; a standard 6.5mm jack headphone plug; a USB A plug (hidden by a fixed cover) to connect a smartphone; two discreet lines of LEDs, those in the upper line indicating the source in use, and those below the frequency of the sample, or, to be precise, whether it is in the 88.2/96 kHz group or 176.4/192, or whether it is DSD, the standard frequencies of 44.1kHz and 48kHz having no LED marker. 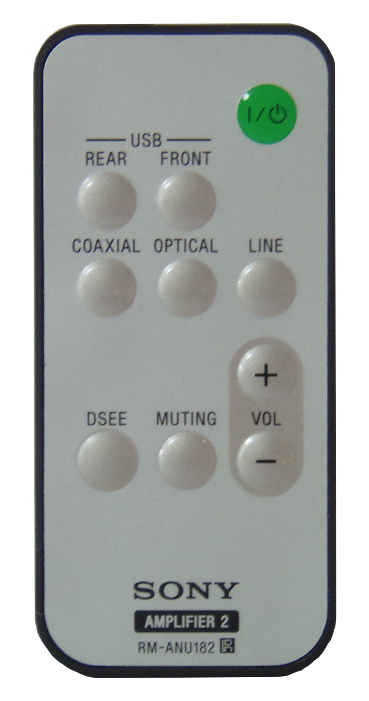 On the far right side of the front panel there is the source selector button, the volume control, and the LED indicating silent mode and the LED indicating the activation of the DSEE (Digital Sound Enhancement Engine), which makes it possible to optimise the sound quality of compressed music; and, right at the bottom, the remote control receiver window. On the rear panel of the Sony UDA-1 there is a USB B plug for connecting to a computer; two S/PDIF inputs (coaxial and optic); and also an analogue input and output. Under the speaker terminals, which are of high quality and take stripped wires like banana plugs, there are two slider switches. The first, which is marked ?Auto Standby" switches off the power after a long period without digital signal, while the second equalises the frequency response so that it can be adapted to the brand?s SS-H3 speakers. As we said, the front panel and the upper surface of the housing are one, and are made of brushed anodised aluminium, and the flanks make do with painted plastic. The UDA-1 is available with either a black or silver finish. The inner frame is made of folded steel plates and a firmly-screwed-in panel gives the structure rigidity, which is no luxury given how much this little amp weighs! 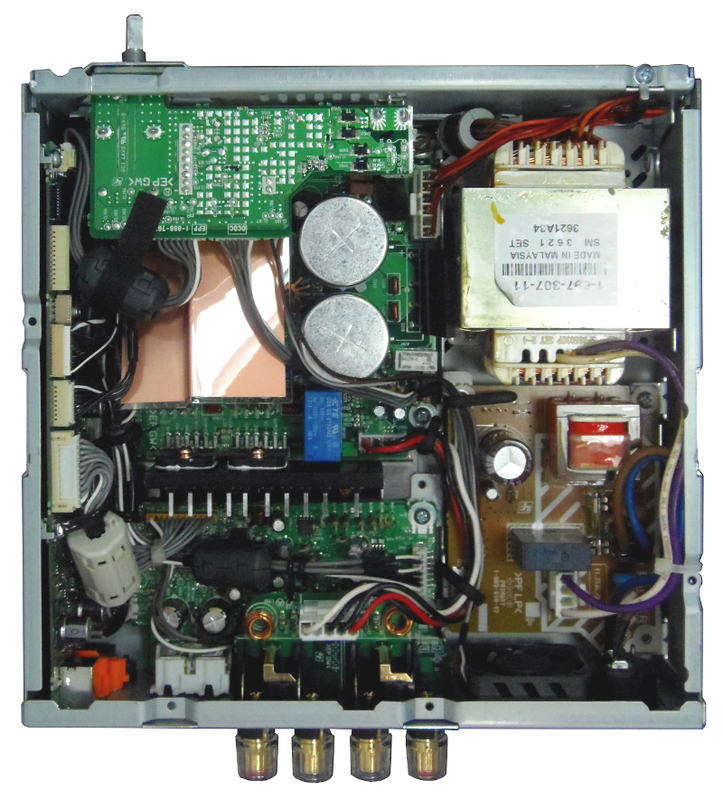 No space is wasted inside the UDA-1, as you can see below. Note that Sony has gone for a traditional power supply, using a transformer which is in proportion with the power available (2x23W), and which takes up space, like the two 6800 ?F/25V Nippon Chemi Con ?Audio? capacitators, which are placed on the main circuit. 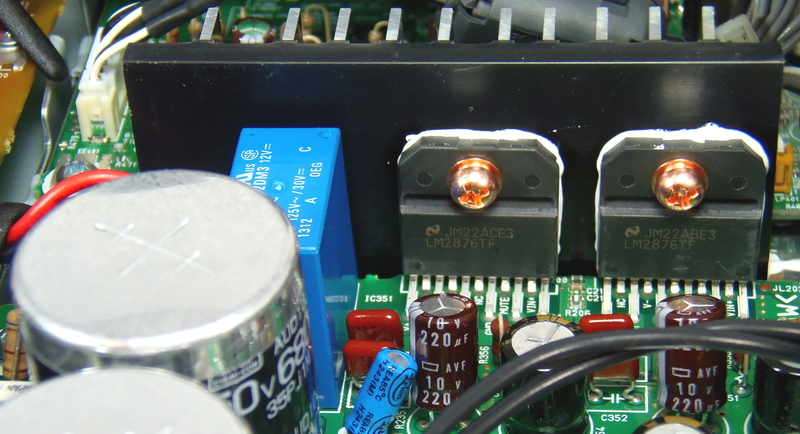 We also note the little transformer which powers the static current circuit with the sector?s switching relay. 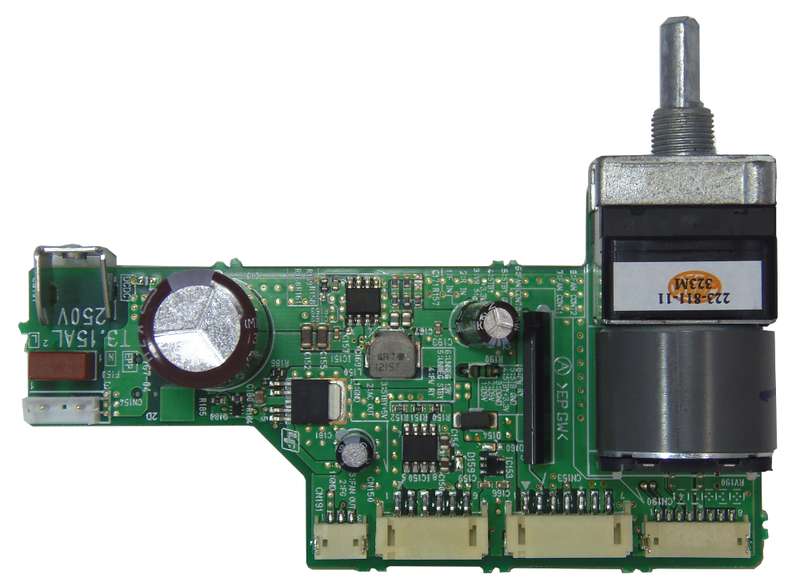 The volume control is part of a separate circuit (upper left portion), and comes with a motorised Alps potentiometer (it would appear that this controls an NJW1194W integrated volume circuit which is present on the main circuit, by means of position detection), while the circuit which receives the digital input signals and treats them is mounted along the flank which is on the left of the photo. The command buttons, the LEDs, the headphone sockets and the USB A are all sited on a circuit which is mounted parallel to the front panel and the remote control receiver is a small separate module (all of which is on the left hand side of the photo which was taken ?upside down?). On this recto/verso view of the digital input card, you can see in the lower image a USB CMedia CM6632A processor (one of the highest-performing chips currently available), which extracts the different signals required for the digital analogue converter circuit from the USB digital flow, and this with very low jitter. 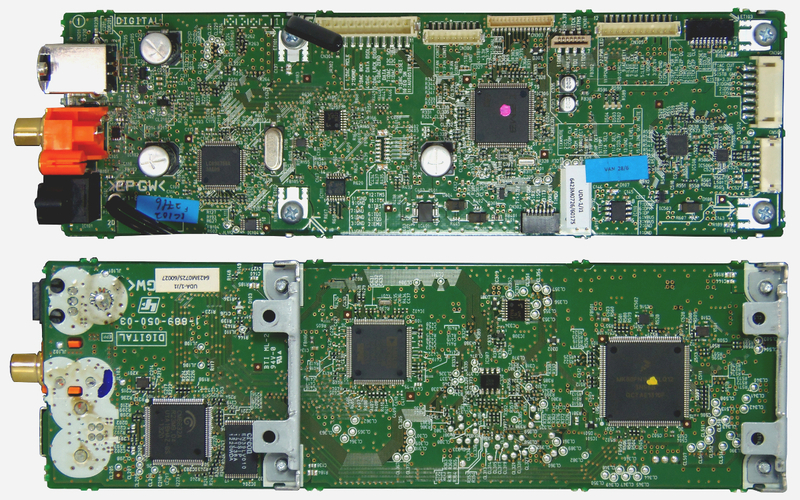 An Analog Devices ADSP-21488 digital signal processor can also be seen: it deals with improving the restitution of compressed signals, and with the equalisation required to use the UDA-1 with the SS-H3 speakers. A Burr-Brown PCM1795 circuit looks after digital analogue conversion, including for DSD signals (raising the question of where the latter are processed, which we deal with in another test-bench). Filtration is carried out by the low-noise and low-distortion NJM4580 operational amplifiers. Sony uses two integrated National Semiconductor LM2876 amplifiers which offer good performance and deliver nearly 25W per channel to the UDA-1, a level of power which is a function of the supply voltages which are sent to them. 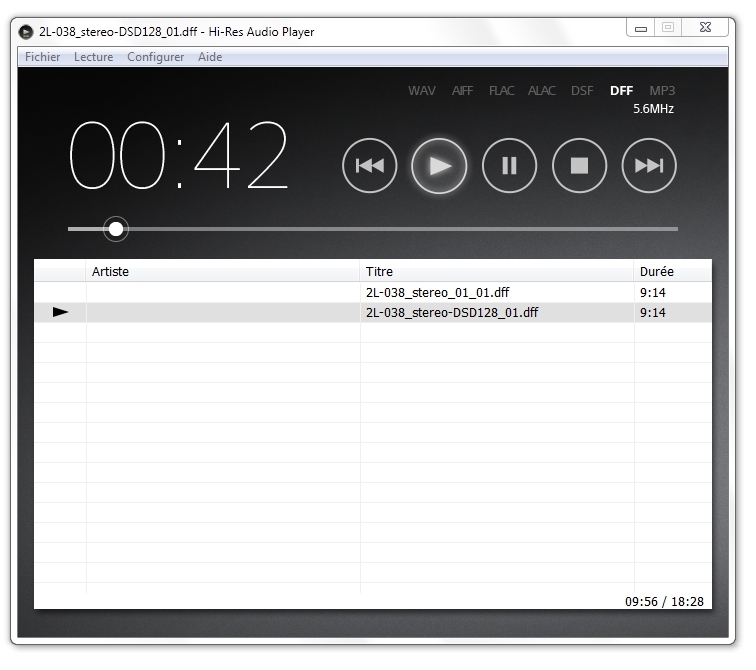 Sony offers its own reader software (free of charge), which is called ?Hi-Res Audio Player? and which can read all file types, including files in DSD64 and DSD128. We started by listening to a DSD64 file (Mozart?s Concerto for violin in D major by Marianne Thorsen and the TrondheimSolistene, test file 2L.no) using Sony?s Hi-Res Audio Player, using Triangle Antal Anniversary speakers, and to be honest the UDA-1?s sound restitution just blew our minds, to put it lightly? The power might not exactly be phenomenal, but nevertheless it is more than adequate for comfortable home listening, but then, the sound quality is definitely up to scratch, and what quality it is! The sound levels are excellent, the restitution is clear, detailed and dynamic, with a very huge sound range, and a very good tonal balance where the treble is finely detailed and the high violin notes are conveyed very well. The same goes for using Foobar2000 in Kernel Streaming mode to listen to Dvorak?s American Suite by the Budapest Festival Orchestra conducted by Ivan Fischer (24-bit/192kHz Studio Masters version), where the artistry of the Czech composer?s orchestration finds a perfect complement in the UDA-1 which reproduces the smallest details without any difficulty, and allows su to appreciate the richness of texture of the triangle or the cymbals. We also appreciate the ease with which this device follows the dynamics of the music, despite its relatively modest power (for example, listen to the 1st Allegro from the American Suite, which mixes things up nicely by alternating between quiet passages and furious rhythms). When it comes to the restitution of Giorgio by Moroder from the seminal album Random Access Memories by Daft Punk, everything is clear and precise, and you really get the feeling that the singer is standing there between the speakers, while the bass thumps away nicely and firmly, even at really quite high sound levels. Sony also gets top marks for the headphone output (which seems nevertheless to be sensitive to headphones with low impedance, meaning that you need to control the volume with care). With the Sennheiser HD 700 headphones, with their 150 ? impedance, nothing is lost from the restitution of the famous Hotel California (24-bit/96kHz Studio Masters version) by the Eagles ? the bass notes are strong, the voices have great presence and good definition and the guitar?s staccato quality is brought out well. We note also that the sound quality is very good, even at higher sound levels. A brief word to finish up, about the sound sensations produced by the SS-H3 speakers which Sony recommends, as they possess a preprogrammed equalisation for this model. The sound restitution is decent without equalisation, and activating it brings a bonus into the lower range which produces more presence and a richer sound. We think, however, that the sound qualities of this UDA-1 deserve to be let loose on much more ambitious speakers, taking care to choose speakers with an output which is at least equal to 90 dB/1W/1m to make up for its relatively modest power. 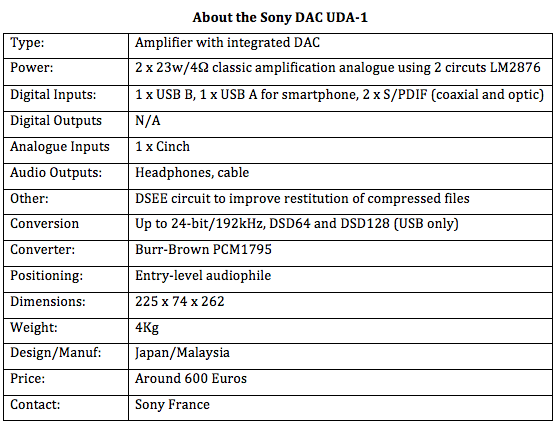 To conclude, this Sony UDA-1 amplifier with DAC shouldn?t be judged on the basis of its power. Its sound restitution is of very high quality, for listening over speakers as well as over headphones, and its DAC is capable of dealing with High Definition audio up to 24 bits at 192kHz, and also DSD64 and DSD128 via the USB port. This is a device for audiophiles and music lovers, at a pretty nice price. So it?s definitely very Qobuz! Ecoutes de l’album de Eagles – Hotel California en Studio Master 24-bit/96 kHz : Qobuz a testé et a pris pension à vie ! Beyerdynamic A 200 p draagbare DAC / hoofdtelefoonversterker: compact maar uiterst veelzijdig!